USB-C is fast becoming the standard charging and connectivity technology of choice among the latest released Android smartphones, latest iPhones, laptops including Macbooks, and even gaming devices. Latest released smartphones such as Samsung Galaxy S9, S9+, iPhone Xs, Xs Max, X, Xr, X, 8/8+, Google Pixel 3, LG V40 etc. all support USB-C or USB-C PD charging. Nintendo Switch – currently the the most popular handheld gaming console – and most high-end laptops now support USB-C charging as well. USB-C PD is now preferred charging standard for Apple’s all new and upcoming iPhones, and all future Android phones. It is safe to say that buying a USB-C PD powerbank is a future-proof investment. The USB-C standard is highly confusing due to various versions/supported voltages and the wide range of power output it supports. We have, therefore, simplified the choice by recommending best USB-C powerbanks according to their most intended use. You can also go directly to the bottom of this article to view the table listing USB-C PD powerbanks for mostly charging smartphones or the table listing best USB-C PD powerbanks for charging both Smartphones & Macbooks. USB-C PD charging Watts – The maximum charging output of powerbank is expressed in watts. 15-watt is the absolute minimum that a USB-C powerbank should offer and this is usually the maximum power output offered by the older first generation USB-C power banks. 15 watt is also the maximum charging speed supported by the Nexus 6, Nexus 5X phones. 18+ watt USB-C PD charging support – Almost all latest smartphones in the market today support 18 watt fast charging over USB-C PD. This includes Samsung phones (S9, S9+, S8, S8+, Note 9, Note 8, S7 etc.) and new Apple iPhone Xs, Xs Max, XR, X, iPhone 8 and iPhone 8 Plus. Nintendo Switch also requires 18 watt USB PD to charge it while playing. 30 or more watt USB PD support – This feature applies if you intend to charge Macbooks or USB-C laptops with the powerbank at fast speeds. Your Macbook or laptop will only charge very slowly with a 15-watt USB-C powerbank. In fact, many Windows laptops will not charge at all with the 15-watt USB-C powerbank. In order to charge your Macbooks or compatible laptops at the fastest speed, you will need a 30-watt or 45-watt USB-PD powerbank. USB-C Input Charging for quickly charging the powerbanks – High capacity powerbanks will take forever (up to 24 hrs or more) to charge with traditional USB wall chargers. Powerbanks with USB-C input can get charged in as little as 4 hours! All USB-C output powerbanks usually support USB-C input as well. Why buy a 18+ watt USB-C PD Powerbank instead of lower priced 15 watt USB-C powerbanks? It will fast-charge most of the latest Android smartphones. Most latest Android phones such as S9, Note 9, S8, Pixel 2, support a maximum of 18 watt (9 volt @ 2 amp) over USB-C PD in fast charge mode. A 18/24/30/45 watt charger will support this mode as it can output 9 volts but a 15-watt charger won’t. 15 watt powerbanks can only charge at maximum output of 5v @ 3 amps. An 18 or more watt USB-C PD powerbank will charge laptops and Macbooks way faster. Such powerbanks can charge at higher voltages (9 or 12 volts or even 20 volts). Powerbanks with 45 or 30 watt charging output will effectively halve your charging time for Macbooks. A 45 or 30-watt charger also offers a reliable charging setup for high current drawing USB-C ultrabooks and laptops as lower wattage chargers can cause charging circuit failures and overload. 18/24/30/45 watt powerbanks can charge a Nintendo Switch AND the joy-cons at the same time. Switch can draw as much as 18 watt of power while playing docked with joy-cons and this cannot be handled by lower-cost USB-C chargers which max out at 15 watt. So, in order to get the maximum charging speed for Switch, it is best to use a 30-watt charger. Here is our selection of top USB-C portable battery banks that deliver the best charging performance with robust and dependable build quality, best selection of features, and responsive customer care. Aukey 10000 18-watt USB-C PD powerbank is our pick as best USB-C PD portable charger for smartphones. This powerbank can fast-charge all the latest iPhones 0 to 50% in just 30 minutes. It will also fast-charge all popular Android smartphones including all Samsung smartphones (S10/S9/S8/S7/Note 9/8) and all Android phones supporting QC 3.0. Weighing about 8 oz (230 gm) and at about 1 inch thick, Aukey 10000 18-watt USB-C PD is pocket friendly as well. A great feature of Aukey 10000 USB-C PD is that it can both by USB-C cable and directly with Apple lightning cable. Charging by lightning cable is a very handy feature for Apple iPhone owners as you wont have to carry an extra cable for the powerbank. This portable charger will fully charge Samsung S9/S8/S7/Note 9/8 and iPhone Xs/X/Xr/8 Plus minimum two times. It will fully charge iPhone 8/7/6 minimum three times with some charge to spare. Aukey 10000 USB-C PD powerbank can be fully charged in 3.5 hours with any 18+ watt USB-C wall charger. We recommend the excellent Anker 30-watt dual port USB-PD wall charger for this powerbank. This wall charger delivers 18 watt from USB-C PD for fast charging new iPhones (or the Aukey 10000 USB-C PD ) and also has a 12-watt port allowing you to simultaneously charge your phone and powerbank with one wall charger. Excellently priced good quality fast charging powerbank for latest Androids and iPhones Xs, Xs Max, Xr, X, 8, 8 Plus etc. Full QuickCharge 3.0 output support fast charges almost all Android smartphones including S10, S9, Note 9, S8, S7 etc. Comes with a USB-A to USB-C cable. This is handy for charging USB-C phones with the regular USB port but adding a USB-C to USB-C cable also would have been great. 0.95 inch thickness is a bit high though same as recently launched Anker 10000 PD – Anker’s first 10000 mah USB-C PD powerbank (below). 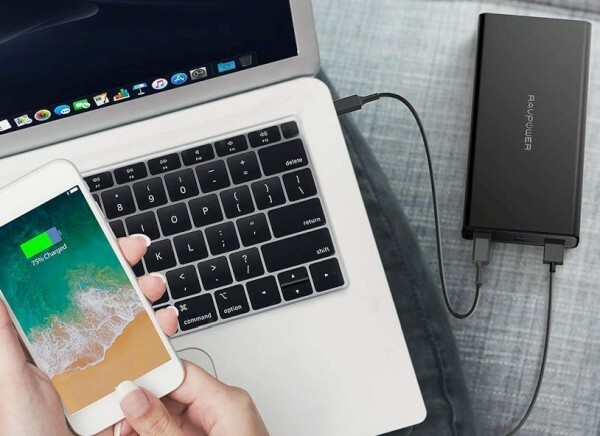 Launched in February 2019, Anker PowerCore 10000 USB-C PD powerbank is our #2 pick as best USB-C PD portable charger for smartphones, both Android and iPhones. PowerCore 10000 USB-C PD is Anker’s first 10000 mAh class powerbank that can fast-charge all the latest iPhones 0 to 50% in just 30 minutes. It will fast-charge all popular Android smartphones including all Samsung smartphones (S10/S9/S9+/S8/S7/Note 9/8). At just 6.8 oz (190 gm) and at about 1 inches thickness with a long design, PowerCore 10000 USB-C PD quite pocket though not as much as Zendure 10000 PD (.6 inches thick). PowerCore 10000 PD will fully charge Samsung S9/S8/S7/Note 9/8 and iPhone Xs/X/Xr/8 Plus minimum two times. The portable charger will fully charge iPhone 8/7/6 minimum three times with some charge to spare. Anker PowerCore 10000 PD can be fully charged in just 3.5 hours with any 18 or more watt USB-C PD wall charger. We recommend the excellent dual port Anker Powerport PD2 30-watt USB-PD wall charger for charging it . 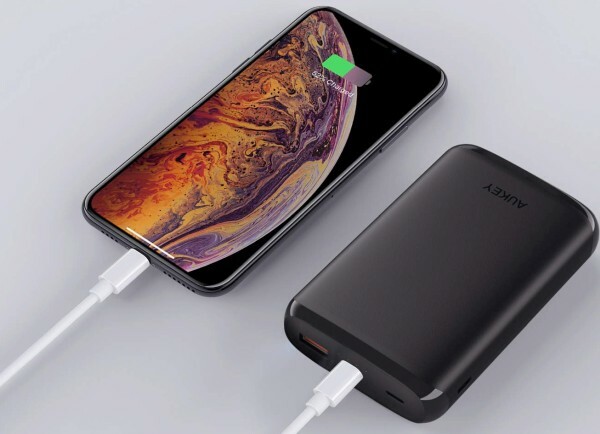 Anker Powerport PD2 wall charger will also fast charge new iPhones (Xs/Max/Xr/X/8/8+)and comes with an additional 12-watt USB port that you can use to simultaneously charge your phone and powerbank with one power outlet. The only reason we are not placing PowerCore 10000 PD is its high price. PowerCore 10000 PD is priced way higher than our #1 pick Aukey 10000 USB-C PD and offers same features, form-factor, and nearly same build quality. Terrific premium quality fast charging powerbank for latest Androids including Samsung S10/S9/S9+/S8/Note 8 and iPhones Xs, Xs Max, Xr, X, 8, 8 Plus etc. 1 inch thickness. The new 4 inch x 2 inch long design is more pocketable but slimmer design would have been much better. If you want a powerbank that can not only fast-charge all smartphones (Apple/Samsung other Android phones) but also charge Macbooks Pro, Macbook Air etc. at fastest speed currently possible from powerbanks, then our top choice as 45-watt PD powerbank is RAVPower 20100 45-watt PD 3.0. This powerbank features an incredible 45 watt USB-C PD charging output, full support for fastest charging of all latest smartphones (both iPhones and Android) and stellar build quality. RAVPower 20100 45-watt PD 3.0 delivers 45 watt charging power – more than the original Apple MacBook Air’s 29 watt wall charger. This means that it can charge your Macbook Air faster than it takes to charge it by the original Apple wall charger. We highly recommend this powerbank if you have a USB-C chargeable laptop, especially Macbooks as well as newer models of Dell XPS 13 and XPS 15. Laptops require much higher charging output than smartphones. Most phones can only take a maximum of about 18 watt charging output from the powerbank. However, most USB-C laptops can benefit from much higher USB-C PD charging outputs – 30 watt or higher. 45 watt USB-C charging will charge USB-C laptops and Macbooks at almost 50% faster rate than 30-watt charging. USB-C PD is fast becoming the standard for charging laptops with all new Apple Macbooks and most other latest laptops supporting USB-C PD charging. If you want a quality 45 watt USB-C PD powerbank at lowest cost and do not need a bundled USB-C wall charger than RAVPower 20100 45-watt PD 3.0 is currently the lowest cost quality option in the market. It’s only other 45-watt competitor is the Jackery Supercharge 20000 PD but we found RAVPower 20100 45-watt PD 3.0 to be lighter and better built than Jackery. It can be charged with a regular USB wall charger in 10-12 hours or with a 30-watt USB wall charger such as Anker Powerport II USB-C PD 49.5 watt wall charger in just about 4 hours. Also, remember to buy a 30 watt or more USB PD charger such as Anker Powerport II USB-C PD 49.5 watt wall charger (and not a regular 30 watt USB charger) to go with this powerbank. Apple’s standard Macbook wall chargers will work fine as well. Supports the new fast charging mode for iPhone Xs Max, Xs, Xr, 8, 8+, and iPhone X (50% in 30 minutes). An option with bundled USB-C PD wall charger would have been nice. To charge RAVPower 20100 45-watt in 3.5 hours or less, you require a 30 watt PD wall charger such as Anker Powerport II USB-C PD wall charger or the Macbook PD wall charger. Anker PowerCore Speed 20000 PD is our next choice as the USB-C PD powerbank for smartphones and occasional charging of Macbooks. It offers 24 watt of maximum USB-C PD output, making it perfect for charging all the latest smartphones such as Samsung Galaxy S10, S9, S9+, S8, S8+, Note 8, S7 etc. and Apple iPhone Xs, 8, 8+ at their maximum supported charging speed. The new iPhones Xs/8/8+/X can be fast charged to 50% in just 30 minutes over USB-C PD 18 watt. PowerCore Speed 20000 PD will fully charge iPhone 8, 7, and 6S about 6+ times and iPhone X, 8 Plus, and 7 Plus 4+ times. It will charge Samsung Galaxy S10, S10+, S9, S9+, S8, S8+, Note 8, S7, LG V30, V20 etc. 4+ times as well. The powerbank comes bundled with a quality 30-watt USB-C PD wall charger, which you can also use to fast charge your phones directly or to charge your Macbook at 30-watt fast speed (same as Apple’s stock 29 watt Macbook wall charger). PowerCore Speed 20000 PD has two charging ports (one USB-C and one standard USB) and weighs about 14oz. A sturdy body with 18 months warranty further assure continued functioning under heavy use. Anker PowerCore Speed 20000 PD will also charge the latest Macbooks and iPads at pretty fast 24 watt charging output. If charging Macbooks even faster is important for you than we will instead recommend a 30-watt USB-C PD powerbank such as RAVPower 26800 USB-C PD or Anker’s PowerCore+ 26800 PD . Fastest charging for Nintendo Switch – can charge Switch while it is being played. Bundled with a quality USB-C wall charger that can also act as fast charger for iPhone Xs, Xs Max, X, 8, 8+. Limited compatibility with portable solar panel chargers. If you plan to extensively charge your powerbank using portable solar chargers, then we do not recommend this portable charger. For portable solar panel charging, we instead recommend RAVPower 26800 USB-C PD . RAVPower 20100 USB-C Input/Output with QC 3.0 is our top choice for USB-C powerbanks for all Android smartphones (in fact it is ideal for all smartphones except the Apple’s latest iPhones Xs, Xs Max, Xr, X and 8/8 Plus). RAVPower 20100 comes with USB-C Input (for charging the powerbank) and USB-C Output for charging your USB-C devices. It also has with the latest QuickCharge 3.0 charging port, thus making it an excellent buy if you currently own a QC 3.0 or 2.0 smartphone such as S9/S8 etc. And all this is available with a solid build quality and at an incredible price. 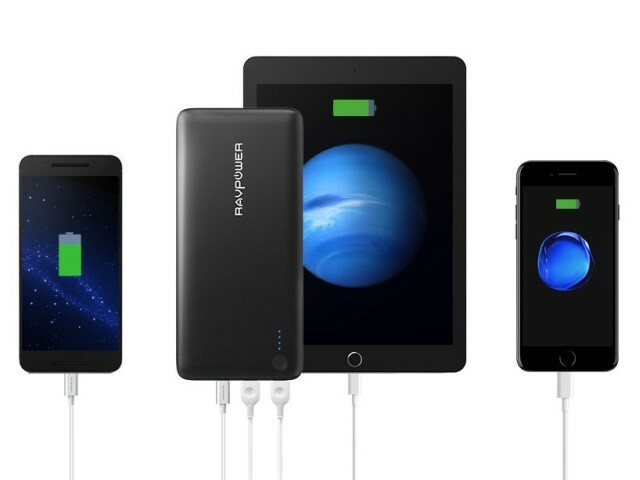 RAVPower 20100 has a total of three USB charging ports – one USB-C, one USB Quickcharge 3.0 port, and one smart 2.4 amp USB port. Please note that RAVPower 20100 USB C will fast charge Samsung Galaxy S9, S9+, S8, S8+, Note 8, S7 etc. with its QuickCharge 3.0 port. It will also recharge all Quickcharge 3.0 phones such as LG V30, Sony XZ1, Nokia 8, HTC U11/Ultra etc. via the QuickCharge 3.0 port. RAVPower 20100 USB C will fast charge Google Nexus 6 & 5X through the 15 watt USB-C port. 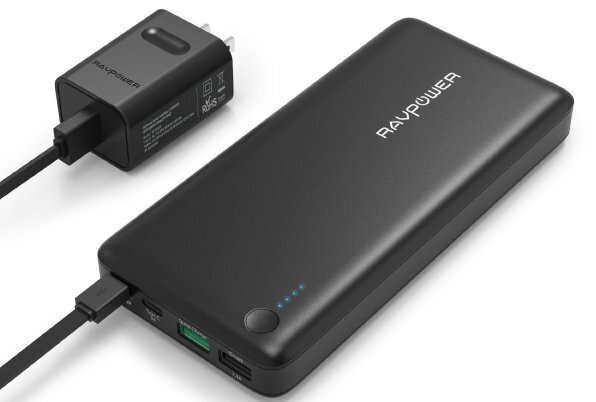 RAVPower 20100 delivers maximum 15 watt over USB-C but can deliver 18 watt over QuickCharge 3.0. This is the reason why it can fast charge the latest Samsung S9/S8/S7 and all the latest Android smartphones with its Quickcharge port. RAVPower 20100 USB-C Input/Output with QC 3.0 can be fast charged by any QC 3.0 wall charger as well as most wall-chargers that come with Android phones, or any USB-C wall charger. Charging time for this massive 20100 powerbank is just 5 hours with a QC 3.0 wall charger or a Samsung S9/S8/S7/Note 9/8 wall charger. True 20100 mAh capacity of RAVPower 20100 means that you can charge even the latest Samsung Galaxy S8 five times. Similarly, you can charge an iPhone 7 eight+ times and even charge iPad air fully once. A Nintendo Switch can be charged 3+ times with the RAVPower 20100. RAVPower 20100 comes with a high quality QC 3.0 charger and is available at an unbeatable price, which when combines with RAVPower’s record of excellent customer service makes it one of the nest USB-C powerbanks available. You can also use your phone’s USB-C wall charger to charge it directly. Also charges with old micro-USB wall chargers! Bundled QC 3.0 wall charger deal offers excellent value for money. Price! Unbeatable value for the features provided. No USB Power Delivery (PD). Cannot fast charge the latest Apple iPhone X, iPhone 8 and iphone 8 Plus as it does not have 18-watt USB-C PD support. Cannot fast charge Nintendo Switch at its maximum supported 18-watt as the powerbank lacks 18-watt USB-C PD support. Our next pick is – incredibly enough- also from RAVPower but this time with the all important 30-watt USB-C PD output. 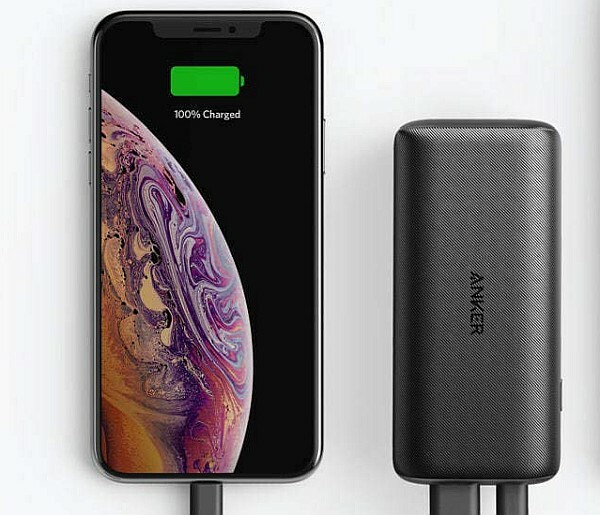 This allows it to fast charge the latest Apple iPhones – iPhone Xs, Xs Max, X, 8, 8 Plus – to 50 % in just 30 minutes. It can also recharge Nintendo Switch at its maximum supported 18-watt current. 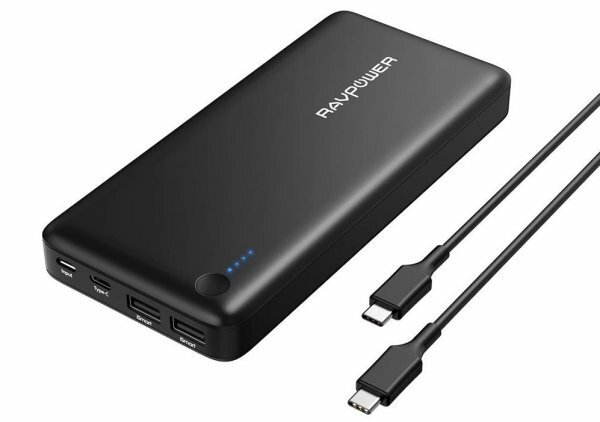 RAVPower 26800 USB-C PD has all of the same features as RAVpower 20100 PD (at #3 below) but with one big difference – it has a huge 26800 mAH battery – the maximum battery size allowed by TSA or international airlines on the flights for carry-on/cabin luggage. This means that RAVPower 26800 USB-C PD can charge a Samsung Galaxy S8 almost 7 times (!!) and an iPhone 7 almost 10+ times. A Nintendo Switch can be charged 4+ times. The RAVPower 26800 USB-C PD can be charged in 4 hours with a 30 watt USB-C PD wall charger. RAVPower 26800 USB-C PD comes with a USB-C reversible cable but does not come with a USB-C wall charger, which has to be bought separately. Hence, remember to buy a 30 watt or more USB-C PD charger such as Anker 49.5 watt PD charger (and not a regular 30 watt USB-C wall charger) to go with this powerbank. Please Note: Only a 30-watt+ USB-C PD wall charger such as Anker PowerPort II PD charger or RAVPower Super-C 36 watt Type-C charger will charge RAVPower 26800 USB-C PD in 4 hours. A regular (non-PD) 30 watt USB-C wall charger will not charge RAVPower 26800 USB-C PD in 4 hours and will take about 10 hrs to charge it. Fast charges Samsung Galaxy S10/S9/S8/S7 at fastest speed. Anker PowerCore+ 26800 PD is a recent release by Anker and is a solid 30-watt USB-C PD power bank. 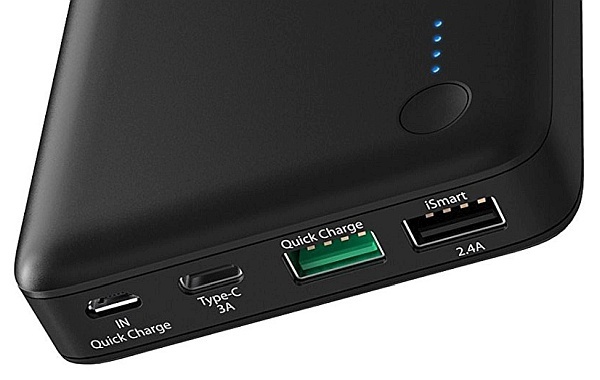 This is at the moment Anker’s highest capacity (and top-priced) portable power bank . The Anker PowerCore+ 26800 PD comes with one 30-watt USB-C PD charging port and two standard USB high speed (2.4 Amp, maximum supported by Apple iPhone) charging ports. Impeccable build quality and backing by Anker’s excellent customer service makes it our top recommended USB-C powerbank if you want to purchase a high capacity USB-C powerbank with a bundled quality USB-C wall charger. The price of Anker PowerCore+ 26800 PD may seem high but it comes with a 30-watt USB-C wall charger which will otherwise cost almost $30 to buy separately. This is also an excellent two-in-one laptop/smartphone charger for owners of Macbook Pros (or other USB-C laptops) and flagship smartphones, complete with the maximum TSA-allowed powerbank battery capacity for carry-on baggage in flights. 30-watt Macbook compatible output, smooth and consistent USB C PD output, fastest charging for latest Apple and Samsung phones, bundled PD wall charger and maximum TSA-allowed capacity makes one of the best portable chargers options available. 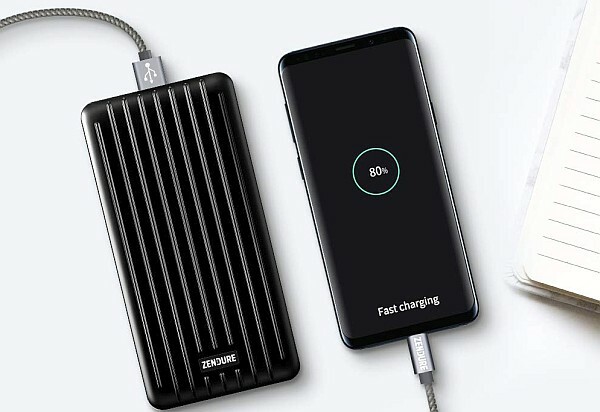 Will fast charge Samsung Galaxy S10/S9/S8/S7 at fastest speed. No option to buy without the bundled USB-C wall charger. If you find the price too high or do not need a USB-C wall charger RAVPower 26800 USB-C PD is a great alternative. Zendure Ultra-Slim 10000 18-watt USB-C PD powerbank is currently our pick as a best slim and most pocketable USB-C PD portable charger for charging the latest USB-C PD smartphones including the latest iPhones Xs, Xs Max, X etc. and latest USB-C PD Android smartphones. Zendure Ultra-Slim 10000 USB-C PD powerbank is one of the very few 10000 mAh USB-C PD powerbanks in the market and has a stellar build quality and ultra-portable form-factor at 7 oz/230 grams. Zendure Ultra-Slim 10000 18-watt USB-C PD powerbank can fast-charge all the latest iPhones from 0 to 50% in just 30 minutes and will also fast-charge almost all popular Android smartphones including all Samsung smartphones and all Android phones supporting QC 3.0. It fully recharges iPhone Xs/Xs Max or Samsung S9/S8/Note 9/Note 8 at least twice. With a weight of 8 oz (230 gm) and a thickness of 0.6 inches Zendure Ultra-Slim 10000 18-watt USB-C PD powerbank is pocket friendly and easy to carry around in the hand with the phone while charging. Zendure Ultra-Slim 10000 18-watt USB-C PD powerbank can be fully charged in 4 hours with an 18+ watt USB-C wall charger. We recommend Anker 30-watt dual port USB-PD wall charger for this powerbank. This wall charger delivers 18 watt from USB-C PD for fast charging new iPhones and also has an extra 12-watt port allowing you to charge both your phone and powerbank simulataneously. Excellent USB-PD powerbank for latest iPhones and Androids. Easily the slimmest premium USB-C PD powerbank in the market. Build quality at par with Anker. 18-watt PD output is perfect for fast charging latest iPhones Xs, Xs Max, Xr, X, 8, 8 Plus etc. Fully supports QC 3.0 output to fast-charge almost all Android smartphones including S9, Note 9, S8, S7 etc. 230 gram (8 oz) weight is convenient. Offers passthrough charging – charge the powerbank while charging your phone through the powerbank. Hello. Thanks for the great info on this site. I have a Lg G7 ThinQ and I am looking for a pocket size power bank for my long hours at work. I usually have to charge my phone a few times a day. What would you recommend? Hi Nick, LG G7 ThinQ supports both USB-C PD and Quickcharge 3.0 with USB-C input. We recommend either Zendure 10000 PD Ultra Slim or Anker PowerCore 10000 PD as pocket powerbanks for G7 ThinQ. Both these powerbanks are very light/compact will get fast-charged with the G7 ThinQ wall charger in around 3.5 hrs and charge your phone from 0 to 50% in about 30 mins. Both the powerbanks will fully charge LG G7 ThinQ twice. Thanks!